Even though Certificate in Business Accounting is an entry level qualification but still the proficiency level required is high and it challenges the students right at start. Paper 01 under CIMA certificate is about Management Accounting and even though syllabus has been defined to make it easier even for the first timers but it will be much better that students with accounting background will find it easier to get along with the syllabus. CIMA C01 Fundamentals of Management accounting paper starts from the scratch by building up the basics about management accounting and the role of CIMA in development of this vast subject. In this course students get familiar with the basic quantitative decision making techniques used by managers and how cost and management accounting can help manage the business by providing valuable aid in planning and control. Students are cautioned right at the beginning that CIMA C1 has a lengthy syllabus and needs time management if students are taking other papers as well. CIMA C1 requires a lot of practice and reading and both numerical and discursive proficiency is expected from students. Syllabus is divided into five major portions where each portion carries much to be understood. Students having no trouble in understanding the technical and business English can take up C1 for self study. However, self-studying student should find someone to guide them. 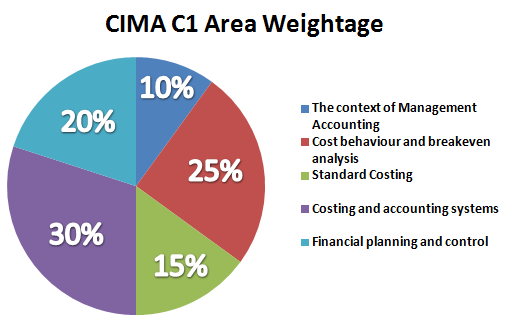 Check the relevant tabs above for more information on specific areas of CIMA C01 Fundamentals of Management Accounting. Click on any of the following buttons to open up the syllabus of the related area. Exam will contain 50 compulsory questions where each question can have more then one parts. As questions are compulsory all the questions are required to be answered with in the given time. It will be a Computer Based Assessment (CBA) i.e. students will be examined in computer based environment where students will be presented with one question at a time and students will answer the questions using input devices like mouse and keyboard. Access FREE CIMA – C1 video lectures exclusively available on this website. These video lectures give you all the tips, tricks and guidance to top your C1 syllabus and pass the exam with great confidence. Access FREE CIMA – C1 Revision Notes exclusively designed to memorize and grab key areas of CIMA C1 syllabus. These CIMA C01 notes can work with any official study text book. 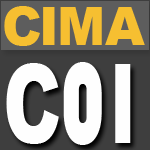 Access FREE CIMA – C01 Practice questions. As past papers for CIMA – C1 are not available these practice questions can help in great to deal to practice different concepts examinable in CIMA C1 course. Access FREE CIMA – C1 Mock Exams. These free mock exams enable you to check, test, stress yourself in every possible way so that you enter exam hall confident. These mock exams come in MCQs format and also include other types of questions. Learn what tips, tricks and topics you must have studied before you sit for an exam. These exam tips specifically details important areas of CIMA C1 course.